Red-Veined Darter (Sympetrum fonscolombii). Male. Taken at nr Novo Delchevo, Bulgaria, on July 22nd 2015. Approx 4.25x lifesize. Male. Taken at nr Novo Delchevo, Bulgaria, on July 22nd 2015. Red-Veined Darter (Sympetrum fonscolombii). Immature male. Taken at La Janda, Spain on September 13th 2010. Approx 3.3x lifesize. Immature male. Taken at La Janda, Spain on September 13th 2010. Red-Veined Darter (Sympetrum fonscolombii). Female. Taken nr Novo Delchevo, Bulgaria, on July 22nd 2015. Approx 4.25 lifesize. Female. Taken nr Novo Delchevo, Bulgaria, on July 22nd 2015. Red-veined Darter (Sympetrum fonscolombii). Immature female. Taken at Greenham Common, Berks, on August 26th 2012. Approx 3.3 lifesize. Immature female. Taken at Greenham Common, Berks, on August 26th 2012. 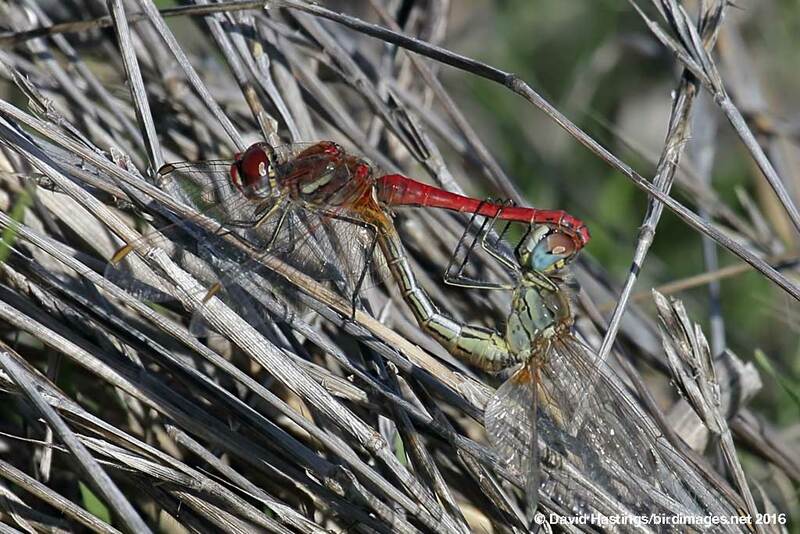 Red-veined Darter mating wheel (Sympetrum fonscolombii). Mating wheel. Taken at La Janda, Spain, on November 6th 2016. Approx 3.5x lifesize. Mating wheel. Taken at La Janda, Spain, on November 6th 2016. There is some doubt as to whether this species is a Sympetrum at all, since it behaves quite differently to others in the genus. 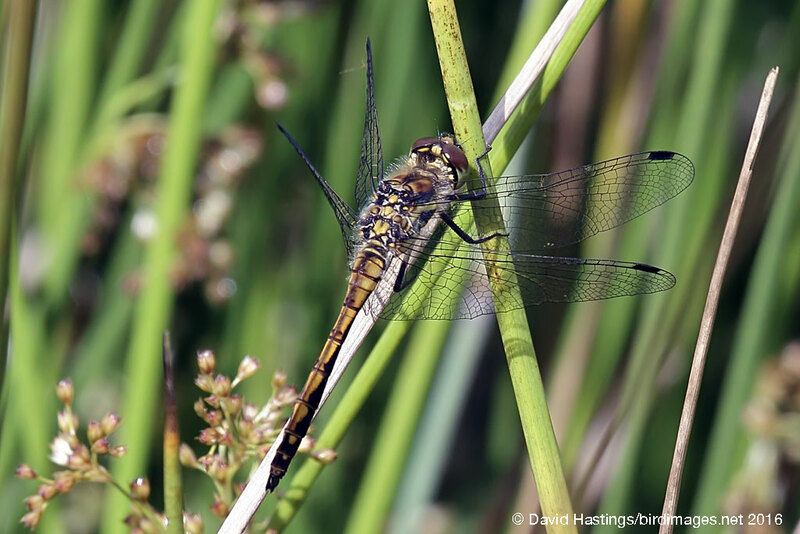 It is strongly migratory and is often seen in northern Europe in early summer when other Darters are only just starting to emerge. Males have a yellow patch at the base of the hindwind, and have red bodies, red wing veins and a red frons. Females have yellow wing veins. Both sexes have blue-grey undersides to the eyes, and the pterostigma are yellowish, edged with black. It is common in the Mediterranean region, but rare and irregular in the north. It can become common here in invasion years, even reaching Britain. Its preferred habitat is warm, still waters, often open, bare and shallow. 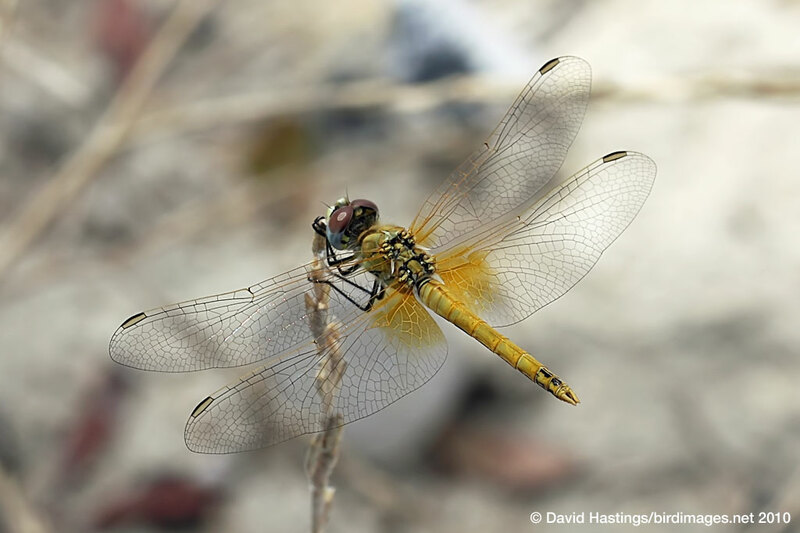 Its life cycle is different to other Sympetrum species, as its eggs develop rapidly after being laid, without a winter rest. It can be found throughout the year in the Mediterranean. Northwards migrations occur from late May, with subsequent reproduction taking only three months. The second generation emerges in mid-August and may persist into November. Males are very territorial and spend more time in flight than perched. The flight is strong and erratic, often hovering far out over water. A scarce migrant in the British Isles.